Boggle–-This word-play game is perfect for many different levels. For young kids, they can search for sight words. Older kids can look for larger words. 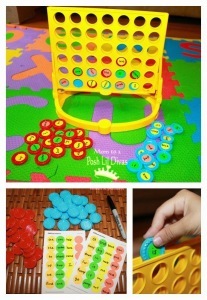 Many teachers use this game at a word work station. Some even have a bulletin board size version of this game in which the letters are changed out daily or weekly! Chutes and Ladders–A classic game! Young kids LOVE this game. Besides teaching vocabulary (not many little ones know what a “chute” is), it also teaches 1:1 correspondence and counting. Not to mention the social skills of how to be a good “loser” when you are sent down the chute! 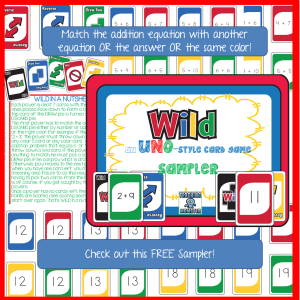 UNO–My favorite game! This is the card game that inspired my WILD card series. My son and I play this often and it helped him with dealing with the frustration of having draw 2 cards, be skipped, or not have a matching card in his hands. The game itself is educational and can be adapted to be even more so! Bananagrams–Another word play game that kids LOVE! I think it is a great way to work on vocabulary words and even practice crosswords (many kids don’t understand how those work!). And, who doesn’t like to unzip a banana to find a bunch of letter tiles!? Apples to Apples–Such a fun (and sometimes funny) game to play with a group! 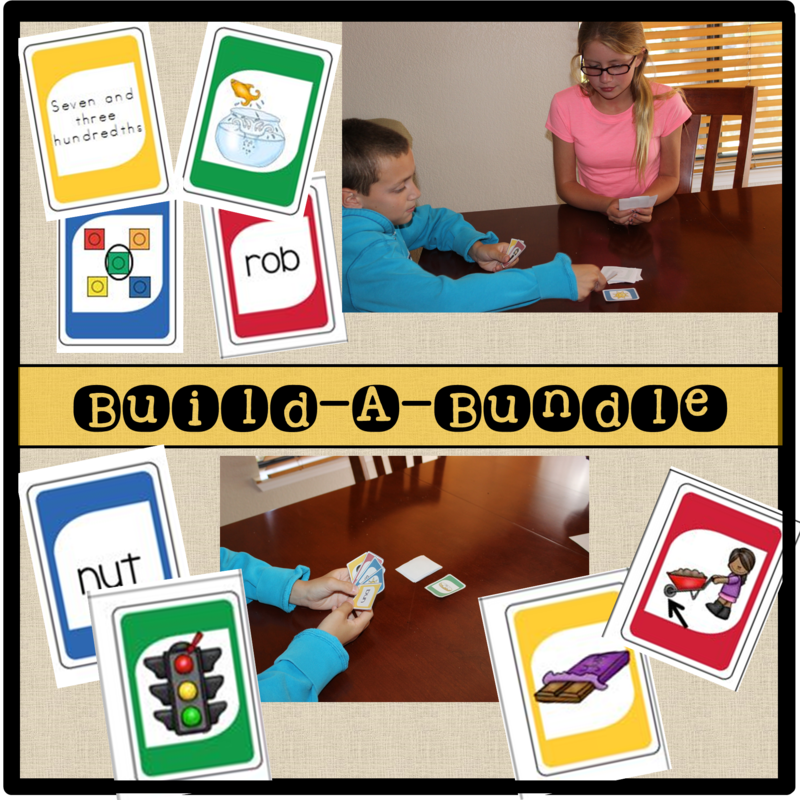 Players receive cards that are nouns. The judge chooses an adjective card and then decides what noun best goes with that adjective. The “rules” are up to the judge….he/she can choose the funniest, the best, the worst, or whatever he/she wants. Be prepared for some cases of the giggles! Skills: parts of speech, social interaction, vocabulary, dealing with disagreements. 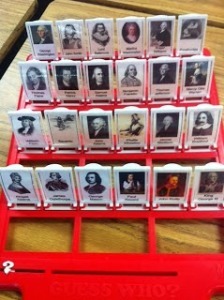 Guess Who–Many teachers have adapted this board game too in order to customize it for their class. No matter how you play, each player has a board in front of him/her that includes pictures of people (or whatever the teacher has included). The players take turns asking yes/no questions in order to guess which person the other player has chosen. I have seen versions that included pictures of kids in the class, animals, and even famous people or states for older kids! Checkers–Another classic game. Students have to use a lot of thinking, both for thinking of their moves as well as for what the opponent may do next. After they master checkers, they may want to move ahead to chess, which has been proven over and over again to increase academic skills! Blokus–This unique geometry game is a lot of fun! The Tetris-shaped pieces make me a little nostalgic. Students have to play their pieces so they touch another piece diagonally without getting themselves “stuck” or trapped. Connect Four–Most students are familiar with Tic-Tac-Toe and this is an advanced version of that game. Again, I have seen some very creative teachers turn this game into a more academic version by adding numbers or sight words onto the chips. With or without these additions, this game gets those little brains working! 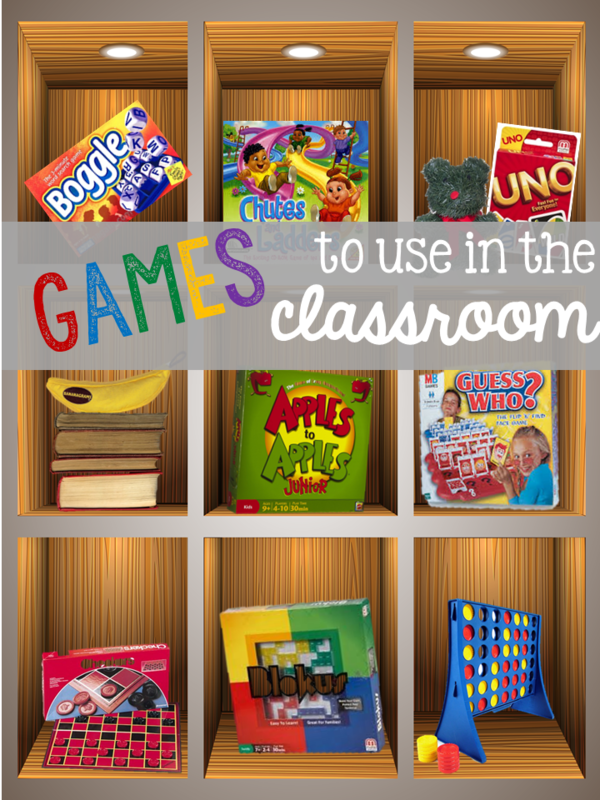 I hope you choose some classroom games for kids to play with your kids this year! Not only does it help the kids become more interested in their learning, but it can help them become even better citizens by learning social skills as well! Watching kids chat, learn, and have fun energizes the whole class! Thanks so much for linking up to our Great Blog Posts for Kinder Teachers! This is surely a great resource as kinders definitely need to learn through playing! Nice Blog. This collection for games is really nice for kids to practice in classrooms for better learning.